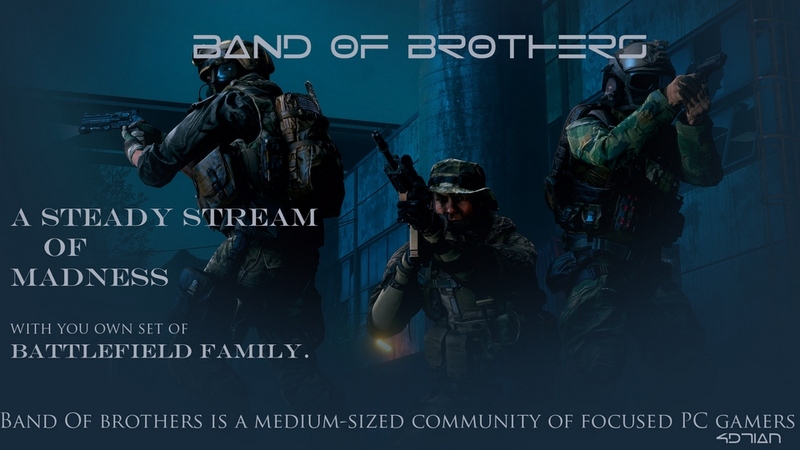 Band of Brothers is a medium-sized, community focused platoon for players on PC. We primarily play Battlefield 1 alongside PlayerUnknown's Battlegrounds, Battlefield 4 and a few other games. We have a TeamSpeak 3 server, a website as well as a welcoming community that typically plays for fun, but also plays the objective. All of our members are friendly, helpful and open to like-minded newcomers. We do not have an age limit, but we expect everyone to behave themselves regardless of their age and moderate the community to ensure a superior experience. We are primarily based in Europe. We have a few members from North America and India as well - you are welcome from any corner of the world as long as the ping and time zones are not an issue for you. However, we will be playing on European servers, so it is your responsibility to consider this first. We use GMT (United Kingdom) time to coordinate ourselves; you can usually find plenty of players on from 4PM to 1AM. Teamplay is strongly encouraged, though we are open to players of all skill levels as a casual platoon. Join our TeamSpeak 3 server, enter the Recruitment channel and poke a member of Staff letting them know you are new around here (identified by their Server Group - Recruiter, Event Manager, Leader, Administrator or Founder). They will help you out. To become a full Member, you will need to go through a short recruitment process with a member of Staff. In essence, the process is a friendly introduction and not a test. It can be done at any time you wish, provided there is active Staff online. You are welcome to either play with us for a few days first, or join straight away, whichever way you prefer. During the recruitment process you will be introduced into the clan, shown around the website and given full Member rank and privileges. The only requirements we have are a microphone, knowledge of English and activity on our TeamSpeak 3 server. BF1 Platoon: "The Band of Brothers"
Should you require any further information, please do not hesitate to contact us via TeamSpeak or the Forums on our website. they had patience with me because i don't speak english very good, also, they are teaching me some english. They are very helpful too. As it says in the main post, please come on our TeamSpeak and have a chat with the guys. It seems like you are from USA, so please consider the time zones and pings first as we are primarily an EU community. You are always welcome in BoB!